Please contact owner Richard via Email: momgab@aol.com - or Phone: 510-547-0815. 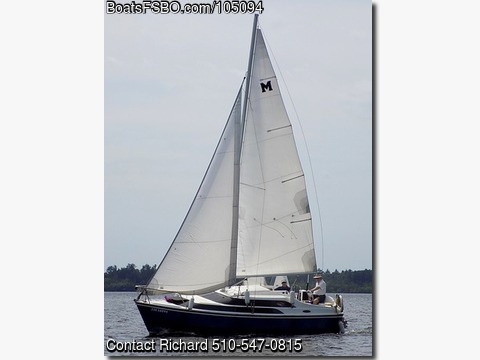 All Original Sails in Great Shape, 5 Sails Total, including a Newer Heavy Duty 2nd Fully Battened Mainsail 2013, Spare Stainless Steel Cables for Rigging, Foam Flotation, 1200lbs by Water Ballast, Spare Rudder, Depthfinder, VHF Radio, Carpeting, Sink, Head, Lots Of Storage, 2 Ladders, Bilge Pump, Coast Guard Package, w Extra Safety Equipment, 2 Anchors, Daggerboard, Spare Prop, Factory Matching Trailer with Stainless Steel Disc Brakes, and Custom 2nd Axle. This is an Original Owner Boat that has been carefully Professionally Maintained since new.